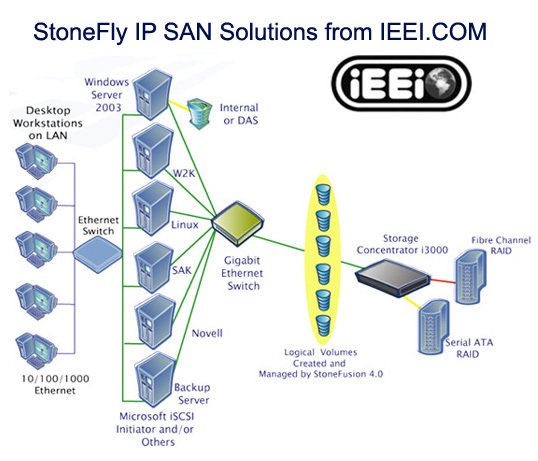 IEEI is happy to provide StoneFly Networks IP SAN storage solutions. 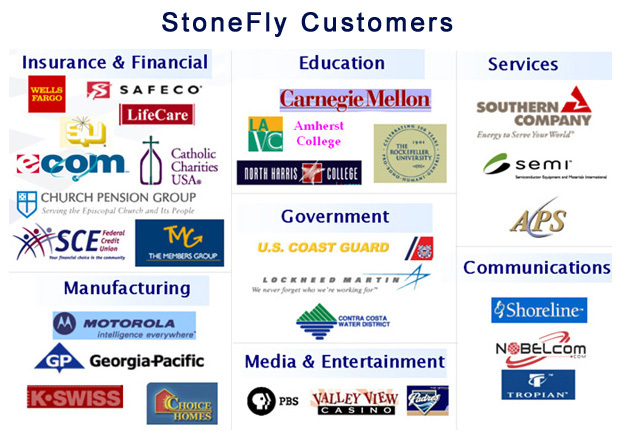 StoneFly Networks is a leading supplier of IP SAN solutions for value-oriented small- and medium-sized businesses focusing on storage & data management, disk-to-disk backup and disaster recovery. - Are you are currently using Fibre Channel SCSI SAN? Need to grow the FC SAN, but too expensive? Cumbersome? Need to add expensive HBA's, critical servers have to be powered down, complex, time consuming. How about those EXPENSIVE maintenance costs. - Need to deploy SAN for the first time? Have 2,3,4 servers and need a Storage Area Network. - Looking for a company that can offer serious SAN solutions? Backup window shrinking? Need compliant solutions? You need to look at the advantages of iSCSI and IP SAN by StoneFly Networks available from IEEI. Got FC SAN? Keep your FC SAN, simply add StoneFly IP SAN to the configuration. Need first time SAN? Deploy StoneFly. Easy to install (1 hour), provision shared SAN storage to your servers (SQL, Exchange, Oracle), UNLIMITED server inclusion, remote management, easy GUI, SnapShot and Reflection Mirroring is included! Easily build High Availability HA with StoneFly. D2D, off-site data replication is a snap. True disaster recovery on spinning disk. Granular file restore. All of this at 1/6th the price of traditional FC SAN. Let's talk about how IEEI can help you today make the best purchase decision.